The Philippines, having known as an island country with more than 7,000 islands, is prominent for its white-sand beaches and clear salt waters. It is no wonder why a lot of Filipinos quickly offer places like Palawan or Boracay when asked of the best places to visit. If you are looking for a different kind of nature feast, there’s a perfect place for you – SAGADA. Sagada doesn’t have cream sand or cool seawater. This place that lies at an elevation of 5,000 feet above sea level in the Cordillera mountain range of Northern Luzon offers diverse and distinct adrenaline rush as it provides the right mix of Filipino ethnic culture, nature, and adventure. Sagada boasts lush green hills and mountains, pine-scented air, very rich culture and tradition, unforgettable food options, picturesque rice terraces, refreshing waterfalls, and a lot more! Use this helpful Sagada Travel Guide and prepare to enjoy the natural marvels of the place. Sagada is also accessible via Baguio, Bontoc, Banaue, and Ilocos Sur. Bringing your own car is also possible. Roads to Sagada are mostly paved and smooth but are narrow once you enter Banaue area. The return trip of Coda Lines from Sagada to Manila leaves at 2:30PM and 3PM daily. If you fail to catch those trips, you may ride the local buses bound for Baguio that leave hourly from 5AM to 5PM. Going back to Manila from Baguio should pose as a hassle as buses bound for Manila abound in the area. Most accommodations in Sagada are basic and non-luxurious. Many of them do not provide toiletries. Here are just a few of the best rated among them. See the list of other SAGADA ACCOMMODATIONS HERE. If you prefer camping, you may set up a camp in Kiltepan Peak, Lake Danum, Mt. Ampacao, Marlboro Hills, and Calvary Hill is allowed. LoveEatWander stayed at Casa Robina, a three-story lodge equipped with a kitchen and a common area per floor where guests can cook and interact. A room with a common toilet and bath only costs P300.00 per head per night, and P350.00 per head per night for a room with own toilet and bath. The place is a little far from the town proper, making it very ideal for those who want to stay away from the noise and busy streets. See the photos below to further appreciate Casa Robina. Here are the top tourists’ destinations that you must visit. ECHO VALLEY – a valley that will echo your voice through the mountains after shouting. HANGING COFFINS – the coffins hanging on the limestone walls of the cliff. This is said to be an ethnic approach of burying the dead practiced by the upper-class Igorots. They hang the coffins of their departed loved ones so they will have an easier path to reach the great unknown. LAKE DANUM – a lake in the middle of the pine forest. A perfect spot to do sunset watching. SUMAGUING and LUMIANG BURIAL CAVES – these two are vast caves that require several hours to explore. At the entrance of Lumiang Burial Cave is a pile of coffins, some dated back 500 years ago. Both caves offer magnificent views of the underworld. If you are a sucker for adventure, try the cave connection – go spelunking for 3 to 4 hours in the massive cave system of Lumiang and Sumaguing caves. KILTEPAN VIEWPOINT – accessible also through an hour-long trek. This Sagada attraction offers the best sunrise view in the province. BLUE SOIL & MARLBORO HILLS – also known as the Blue Mountain, Sagada Blue Soil is, well, a patch of blue-colored land in Marlboro Hills. This is a very nice side trip if you opt to watch the sunrise from Marlboro Hills. You can traverse the mountain to reach the blue soil. Wednesday last week when I texted and asked the husband to pick us up from SM Dasmarinas. "Wala ako sa Cavite. Wala din tao sa bahay. Nasa akin susi", came his reply. It was 5PM then. Since I knew we'll have to wait for several hours, and since I am not good at waiting, I decided to just go to Sagada. It was 10PM when the husband called asking where we were. Imagine his rage when I told him we're bound for Sagada hahaha! Yes, from SM Dasma to Sagada. That's how spontaneous I am when it comes to travelling. That was 13 hours of bus ride, 16 hours including our trip from Cavite to Manila, and all we have is a backpack with our swimwear (because we came from Volets Resort that day). To keep us warm during our Sagada stay, we bought some clothes from ukay-ukay. One complete week of rest, adventure, and fun that was. Thanks to my friend Janine, who's also one of the owners of Sagada Grill, for accommodating us. We went to Lake Danum, we climbed Kiltepan and Marlboro, we went to Blue Soil; we even managed to go up the Butbut tribe, too! It was a crazy idea, I know. But everything was worth it, especially when Skye told me, "Thank you for taking me to different places, Ina. I love you always." To my husband who understood my craziness, to him who picked us up from bus terminal when we went back from our Sagada trip, to JimBry who never fails to keep his cool – THANK YOU! In spite of all my lapses you are always there to welcome us back after our pag-iskapo. We love you beyond infinity. Food options in Sagada are almost endless. The only limitation of Sagada when it comes to food is that seafood is not readily available. Why? Because it’s in a far mountainous region. For some reason, the prices of meals are high, maybe due to the tourists’ demands. Our personal favorite is Sagada Grill because they have the most delicious baby back ribs we have tasted our entire lives, not to mention their other specialties like the quesadilla, T-bone steak, and Shawarma Rice. The place is just quite away from the town proper, just beside Casa Robina, but it’s so worth the visit. Did I mention they have affordable rice meals, too?! Other tried and tested favorites are Bana’s Cafe, Yogurt House, Strawberry Cafe, Gaia Cafe and Crafts, Misty Lodge Cafe, Sagada Lemon Pie House, Ramyun Restobar, Masferré Restaurant, and Log Cabin. DIY Sagada trip is a good idea but it requires a lot of effort and planning. It can also be more expensive than joining arranged tour packages. If you plan to explore Sagada on your own, here is a sample DIY itinerary you can follow. This is good for 3 days and 2 nights. 03:00PM ETA Bomod-ok Falls/ swimming, picture taking, etc. Note: Bomod-of falls is a one and a half hours of trek downhill and 2 hours of trekking uphill with the amazing views of the rice terraces and Banga-an community. If you follow the IT provided above, you can visit most of the best places that Sagada offers. If you are joining an arranged group tours, stay away from those that offer cheap packages P3,000 below as they only cover transportation and accommodation. Pagdating ninyo sa Sagada, NGANGA, not worth it. Mura nga wala naman kayo napuntahan. Join those that has activities included, they may be a little more expensive P4,500 above but you will be assured of the quality of tour they provide. 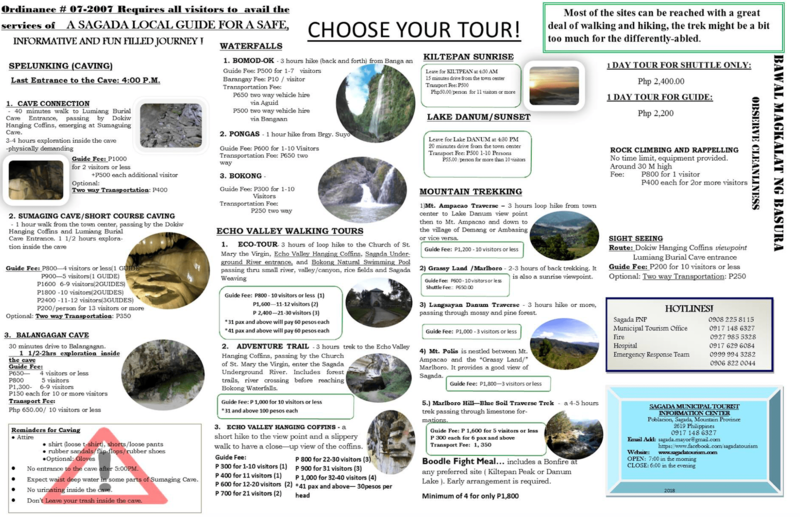 We suggest you contact our travel partner Sole Adventours for Sagada Packages full of actions and adventures. Check the image below for the list and rates of different Sagada activities. Register with the Tourist Information Centre when you arrive and pay the P35.00 environmental fee. Be sure to keep the receipt because you will be presenting it in almost every site you want to visit. The tourist information center is located near the bus drop-off point when you travel via Bagiuo. When you travel via Banaue, you can ask the van driver to drop you there. The information center is open from 7:00AM to 6:00PM. WHEN TO VISIT SAGADA: Sagada observes its annual Bonfire Festival between Christmas and New Year. If you like being part of the tradition, you can take part in this celebration for a minimal fee of around P250 with food, drinks, and transportation to the venue included. Expect an influx of tourists during this time. Visiting top attractions would require lining up and wasting too much time. Sagada is in its coldest at the end of October until late February. Outdoor activities such as hiking and trekking would be ideal on these months. If you are planning to visit the hanging coffin and limestone caves, avoid the rainy season (late May to September) as the local government forbids visiting some places like Samaguing & Lumiang Caves and Mt. Ampacao for safety reasons. The rice terraces in Cordillera are at their greenest during the months of March to April. There is no need to book accommodation in advance unless it’s peak season. There are myriad of hostels/inns in Sagada. Smart and Globe cellular networks work fine, but mobile data and Wi-Fi connectivity may not be reliable. There are only 2 ATMs in Sagada, one inside the Tourist Information Centre and another on the 2nd floor of the next building. It is important to stack up some cash as these machines sometimes go out of service. Be respectful of the local people and their culture. Behave yourself when going to different attractions as these places are sacred to locals. If you will have to take a photo of properties and people, always ask permission. Trekking is the major activity in Sagada due to unavailability of taxis and tricycles. Make sure you have non-slippery sandals or trekking shoes. Local vans and jeepneys can be rented at standard rate to take you to far destinations (see the photo of activities & rates above). Bring a warmer. The temperature drops at night. Observe curfew — 9:00PM to 4:00AM. Conserve water. The supply of water in Sagada is limited and expensive. Bring your own water bottle and just refill in your homestay/accommodation. This practice is more affordable and environmentally advantageous. “If you can’t afford travel insurance, you shouldn’t be traveling.” Heard this phrase before? So yeah, even if you are only going on a short trip or investing on a long journey, you should always travel with insurance. It is easier to have fun if you know you are insured. Love. Eat. Wander. highly recommends a local provider PhilCare which offers affordable packages that cover travel insurance under Assist America. If you have additional tips, comments and suggestions to make this Sagada Travel Guide more helpful to tourists, please contact us or leave a comment below.